Live the dream of the great outdoors, or be inspired by those who do. Have you ever wanted to quit your job and take off on a motorcycle journey from Alaska to Argentina? Do you dream of moving out of your city apartment and into a shipping container house in the middle of the forest? Are you yearning to drink your coffee on the top of a mountain rather than in your office? Take a journey into the great outdoors with Homecamp, where you’ll meet the people who left their old lives behind to follow the dream of the great outdoors, and be inspired to do the same yourself. This beautifully designed book includes the story of a graphic designer who lives in his Volkswagen van, a woman in California who started a female motorbike and camping festival, and a couple who run a yoga and surfing retreat in India. Alongside stunning photography, it offers how-to guides for enjoying life in the natural world, covering everything from finding the perfect campsite to wild food foraging and making the best campfire coffee brew. 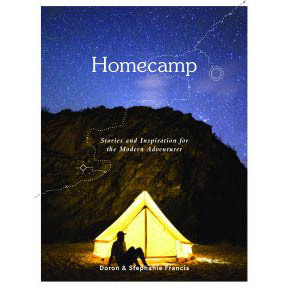 Whether you want to feel the thrill of the outdoor adventure from the comfort of your armchair, or to go out and really explore the beauty of the natural world yourself, Homecamp is the book for you.